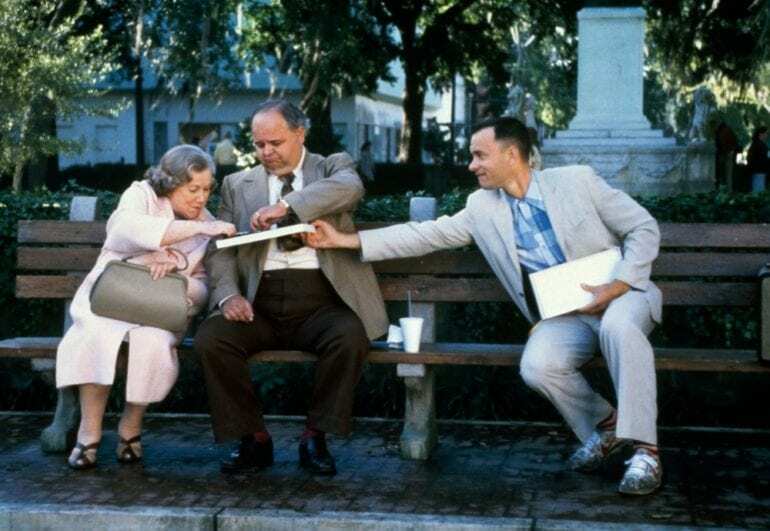 Forrest Gump, starring Tom Hanks, Sally Field, Robin Wright, and Gary Sinise among others, was released in 1986. The film has become one of the most beloved movies of all time, with the catchphrase “run, Forrest, run” running through our minds when we think of the film. But no matter how many times you’ve watched the movie there’s a lot you may not now that went on behind the scenes. 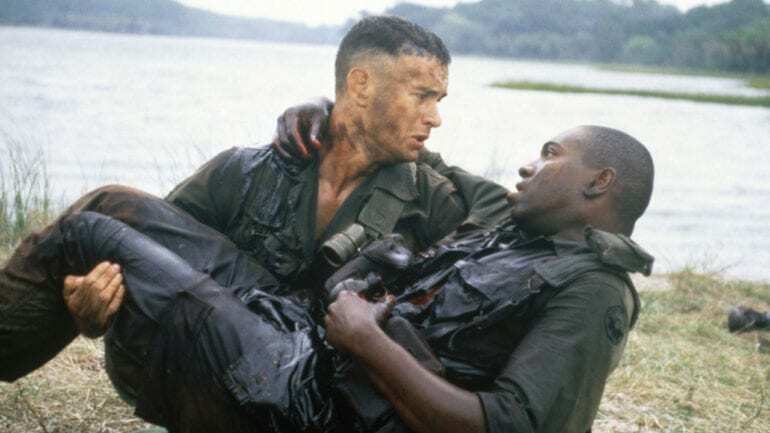 In a stroke of faith and brilliance, Tom Hanks was not paid for playing the role of Forrest Gump. Instead, Tom signed for a certain percentage of the film’s profit. Little did he know the film would be the glorious success that it would later become, earning him a whopping $40 million! We have a feeling Tom must have known what gold he was sitting on when it came to the script and the film itself. It was also Hanks who made Forrest come to life in a way that could not be ignored. Haley Joel Osment was just 6 years old when he played the role of young Forrest Gump Jr.
We were all moved to learn that Jenny ended up having Forrest’s baby in the film and that Forrest would later take care of the young boy without his beloved Jenny (sorry for the spoiler to those who haven’t seen it, but really, you should have). Haley Joel went on to star in films like The Sixth Sense, A.I. Artificial Intelligence, and Pay It Forward. After the mega-success that came after the film came out, talks of a sequel began. 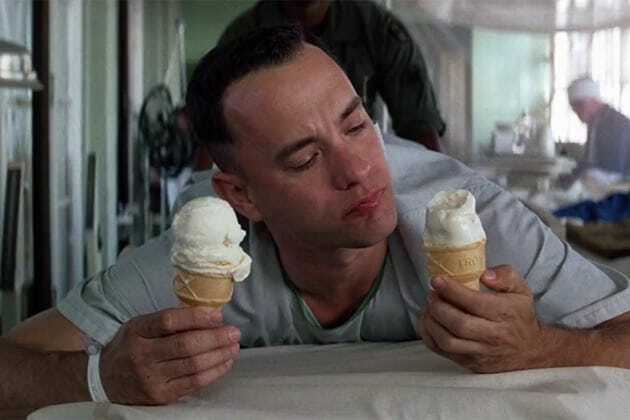 Tom Hanks, knowing what was good for him and for the rest of the cast, immediately rejected any involvement in a sequel to Forrest Gump. We think that was a smart move on Hanks’ part since sequels rarely do as well as the original. He saved Forrest Gump from being like the many films that are done today – sequel after sequel. Believe it or not, Chevy Chase, John Travolta, and Bill Murray were all offered the role of Forrest Gump but turned it down! 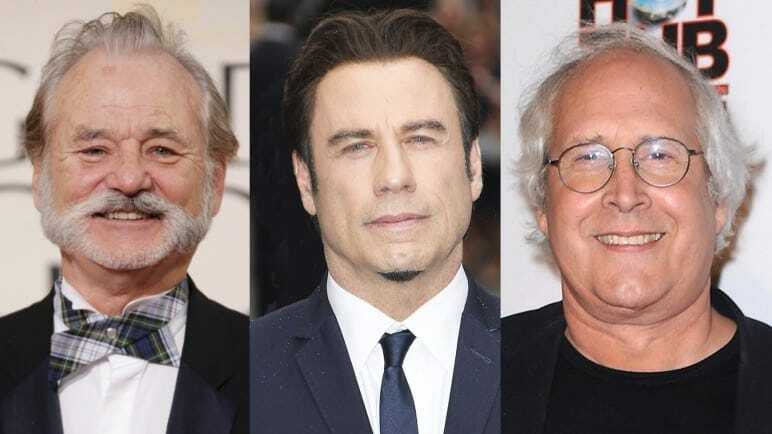 Each had their own reason for passing on the role but only John Travolta said years later that he regretted not accepting the role as it would have made a big difference in his career. Well, Tom Hanks was the PERFECT Forrest so we are happy it went the way it did. 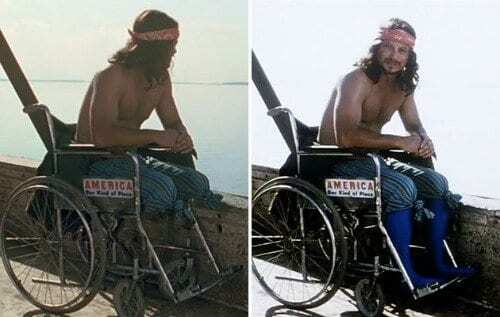 Actor Gary Sinise, who played the role of Lieutenant Dan (we can almost hear Forrest yelling for him now), had his legs wrapped in a special fabric that was painted blue so that later in the editing and effects stage of the production. This was so his lower legs could be removed digitally from the frame so as to make it look like his legs were not there as per his character. This was basically their form of a green screen for his legs at a time when technology was not as advanced as it is today. 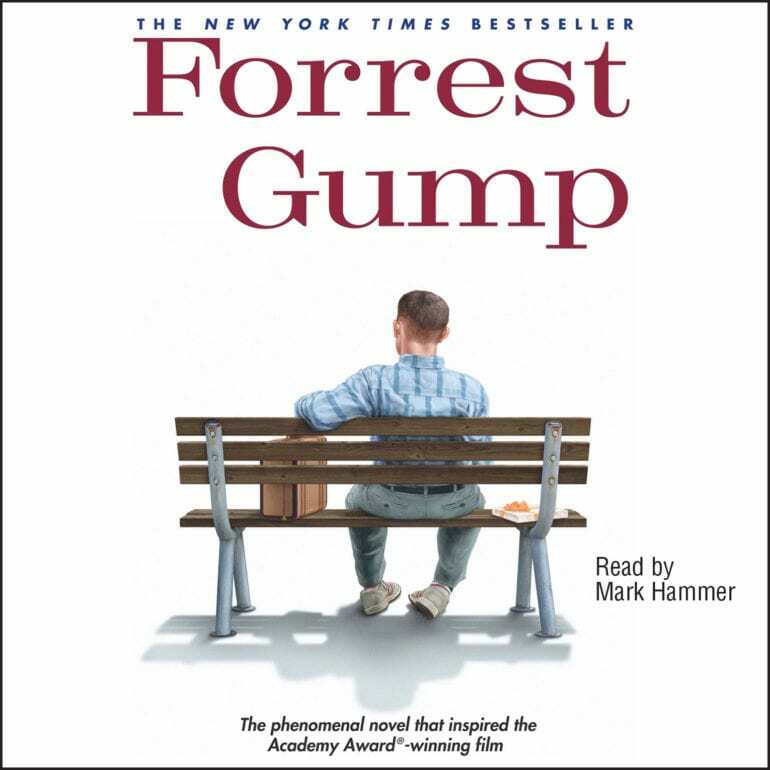 The book, Forrest Gump, sold a mere 30,000 copies when it was first published in 1986. However, when the film came out in 1994 fans of the film flocked to bookstores to purchase the book for themselves. By the end of 1995, the book sold over 1.6 million copies. Author Winston Groom then published a sequel to the book, titled Gump & Co., in 1995 to capitalize on the success of his first story. There is also a cookbook called The Bubba Gump Shrimp Co. Cookbook that has a foreword written by Winston. In fact, resident actress, Sally Field is just ten years older than Tom Hanks! Playing his mother in the film was all thanks to a great makeup department and the fact that Mrs. Gump didn’t live to be too old. The film spans Forrest’s life from childhood to his mid-30s, in the beginning, we see Sally Field as she is but over the course of the film her hair gets grayer and her face more worn. There were certain running scenes in the film that Tom’s brother Jim had to double for since Tom couldn’t run the way that was needed for the scene. Jim Hanks is also an actor but has not achieved the success his older brother has. Jim has written, produced, directed and acted in films like Coveting Roses and Wish, both of which were short films. His television work includes appearances on Dexter, JAG and Smart Guy. The film production obviously did not go to Vietnam to film the war scenes, in fact, they filmed them States side in South Carolina. It was on Hunting Island and Fripp Island that the scenes were shot, including the one where Bubba passes away. The reason for the South Carolina location was due to its lush, dense and green forest landscape. Some of the other locations were in Savannah, Georgia. The missing words from the peace rally in Washington D.C. Remember the scene where Forrest speaks at a peace rally in Washington D.C. after getting back from Vietnam and the microphone gets disconnected so we have no idea what he says? Remember how Bubba talked funny and had a bit of lip deformity? Well, other people in the entertainment industry didn’t realize that he was wearing a prosthetic lip device during filming and therefore didn’t recognize him from his previous acting jobs (Williamson was on over 10 shows before he did Forrest Gump). Once Williamson was on Letterman and was able to explain to the world what the situation, casting directors were more inclined to see him. Williamson eventually landed roles in films like Heat and Con Air. Well, Forrest tends to take things pretty literally. 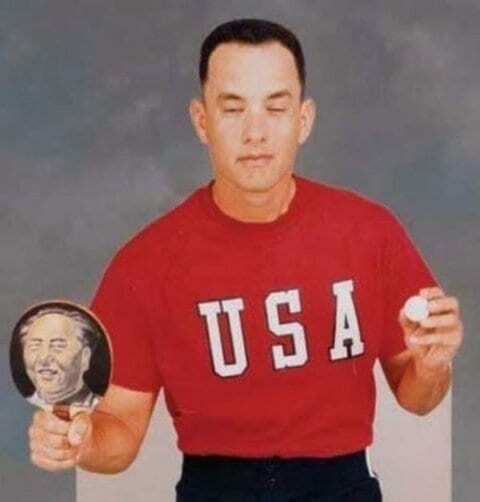 Since the moment that Forrest is told to never stop looking at the ball he does just that, not even blinking throughout any of his ping pong matches so as to not miss a single shot. Groom describes Forrest Gump as a man who is 6 foot 6 inches tall and weighing in at 240 pounds. Tom Hanks is neither of those things, which is why Groom wanted actor John Goodman to play the part of Forrest in the film. In addition to the physical differences, the film cut out some of the feats that Forrest reaches, such as becoming an astronaut, running for the United States Senate, and taking part in a chess tournament. Remember that broken down shrimp boat that ends up making Forrest a VERY rich man? Well, it now resides in the moat that surrounds the Planet Hollywood restaurant in Downtown Disney, which is part of the Disney World Resort in Orlando, Florida. 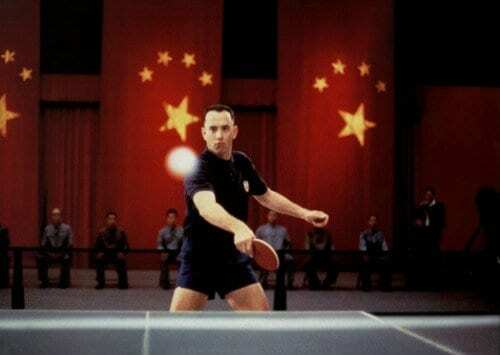 Also at the restaurant is a signed ping pong paddle by Tom Hanks, we mean, Forrest Gump. Many visitors love to take photos together with the paddle. 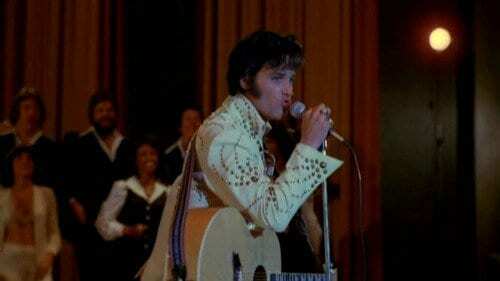 You might remember that the King of Rock, Elvis, makes an appearance in the film. Not the real Elvis, of course, but another version of him who met Forrest and got his signature hip moving move from him. What you may not know is that it was actor Kurt Russell who voiced Elvis in the film. Russell was reprising his role of Elvis Presley from the film Elvis which he starred in back in 1979. Sadly, Kurt was not credited for his role in the film. 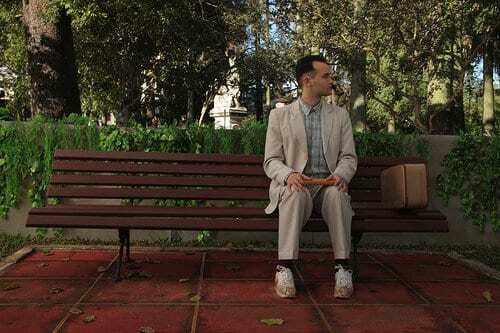 In a 2013 auction, the bench Forrest sat on throughout the film as he was telling his life’s story, was sold for $25,000. The bench was then removed and put in a museum so the elements would not destroy it. The bench was initially located in historic downtown Savannah, Georgia. You can go and see the bench for yourself if you ever happen to be in Savannah. The bench is currently placed in the Savannah History Museum. Tom Hanks has a way of truly becoming every character he plays, and his portrayal of Forrest Gump was no exception. If you noticed, every single photo of Forrest had actor Tom Hanks purposefully shutting his eyes half way to keep more in line with Forrest’s character. We aren’t sure if this was meant to be a sort of innocent way of Forrest trying to look more like his Eastern counterparts or that he just couldn’t handle the flash, but either way, it was very ‘him’. When Lieutenant Dan first meets Forrest and Bubba he was downright rude! He said, “You must be my FNGs”. What FNG stands for is actually – F(expletive) New Guys. Not the friendliest way to start a conversation. Honestly, Lieutenant Dan’s military background and character explain a lot to us in terms of his use of the expletive and the fact that both Bubba and Forrest had no idea what Dan was saying to them, they were just too innocent to understand! Everyone loved Bubba’s enthusiasm for his shrimp, and it was always fun to watch how Forrest took up the mantle in honor of his friend. But the company didn’t just stay in a fictional movie. 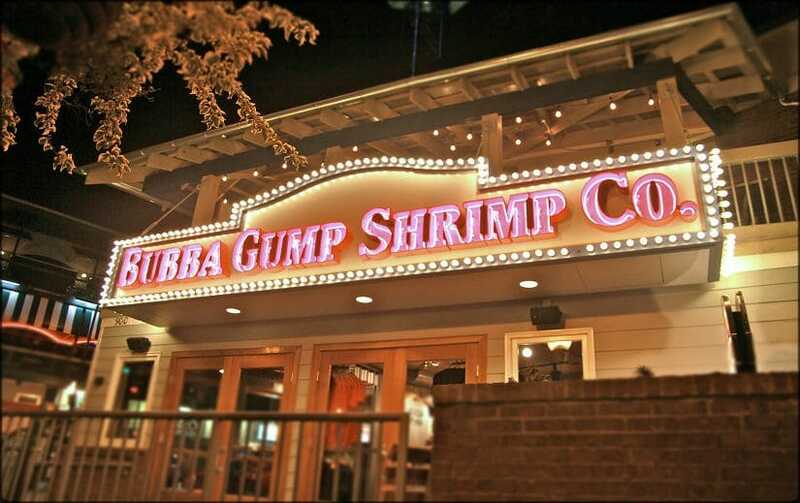 Inspired by the film, The Bubba Gump Shrimp Company Restaurant and Market opened their chain of seafood restaurants to the public in 1996. The chain has locations throughout the globe, in countries like Japan, Malaysia, Mexico, Indonesia, China and the United States. There is no actual connection between the film and the restaurant aside from its theme and name. We see Forrest grow up in front of our eyes throughout the film. Each time Forrest grows within the film, we see him wearing the same type of blue plaid shirt. We see him as a child, then as a young teen, then end of high school, and finally as an adult sitting on the famous bench telling those who would listen to his story. You know what they say about finding something that works for you – you stick with it. The guy who interviewed Forrest when he came to Washington D.C. to get his medal of honor was not an actor but a tourist in D.C. at the right time and place. The tourist was originally from Atlanta, Georgia and was in the nation’s capital with his wife that day. Production saw him and asked him to read the lines. He must have done a pretty decent job considering he was added to the cast. Where else was the production going to find so many men and women with long hair like they had back then than at a Renaissance festival? In a stroke of genius, casting director Ellen Lewis realized that there was a Renaissance festival that usually takes place nearby and knew that there she would find plenty of men and women who would boast long hair fit for a hippie! She indeed succeeded and these men and women were the extras she needed for the scenes in D.C.
After an hour and a half of reading the script, Tom Hanks told director Robert Zemeckis that he would love to play Forrest Gump, but only if the film would be accurate historically. In addition to the plot, Hanks didn’t like Forrest’s heavy Southern accent and wanted to gently tame it. The director convinced Tom to go for the heavier accent and Tom agreed after he also heard the actor playing the younger Forrest’s accent, which was Southern in reality. 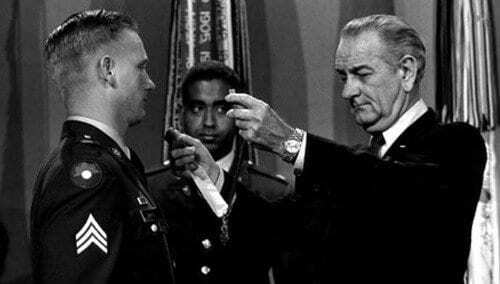 Did the scene where Forrest gets his medal of honor for his heroic behavior during the Vietnam War seem really realistic to you? Well, that’s because it was! It was actually the very broadcast of Sammy L. Davis’ Medal of Honor ceremony performed by President Lyndon B. Johnson back in 1968. Hanks’ face was added to Davis’ body to keep the scene as authentic as possible. How incredible that there is a way to do such a thing in a film! 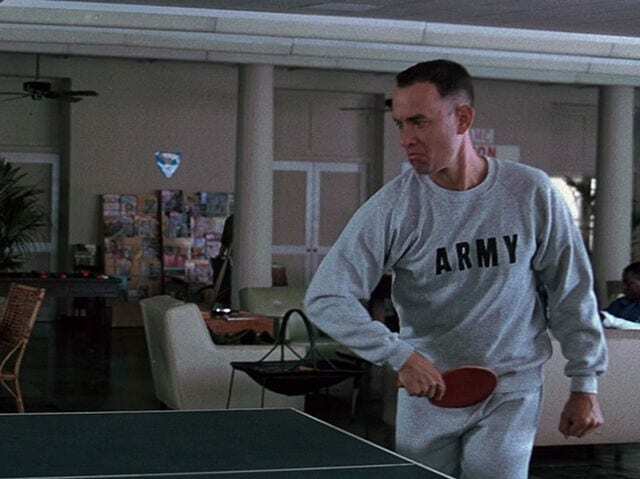 Some people might have wondered if Tom Hanks trained to become a champion ping pong player to play Forrest. In another case of digital additives to the film, the ping pong ball featured in the ping pong tournament scenes didn’t actually exist. The ball was added in editing after the film was done the filming. There was a lot of CGI work to be done to add a moving object that needed to land in a specific location in conjunction with the actor’s paddle. When Forrest gets on the military bus for the first time and sits down next to Bubba, the only person who would allow him to sit next to him, Forrest proceeds to introduce himself. He says, “My name is Forrest Gump. People call me Forrest Gump.” Many people don’t know that the line was not in the script and that Hanks added that last part right then and there. Director, Robert Zemeckis, liked the addition and decided to keep it. Kids of the ’90s always say that they had some of the best movies and shows released in their time, and in this case they may just be proved right. In 1994, at the same time Forrest Gump was released, it was playing in theaters alongside 3 other massive cult-classics – Pulp Fiction, Jurassic Park, and Shawshank Redemption. Forrest Gump managed to crush its top competition, Shawshank Redemption, at the 67th Academy Awards in every category later that year. 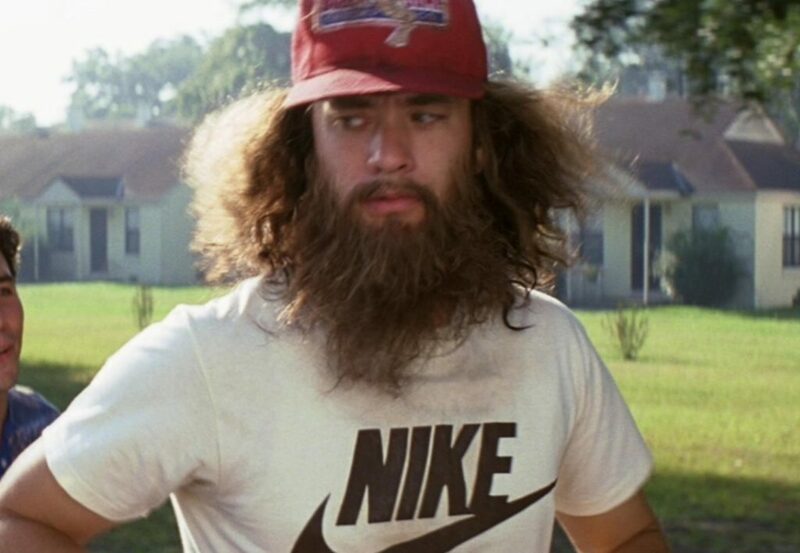 The running segment in Forrest Gump was inspired by an actual event; a sixteen-year-old named Louis Michael Figueroa ran from New Jersey to San Fransisco in 1982. Figueroa ran the distance in support of the American Cancer Society. The line, “I just put one foot in front of the other, When I get tired I sleep. When I get hungry I eat. When I have to go to the bathroom, I go” was inspired by the event. Bubba was a character who was well loved and had a meaningful role in Forrest’s life, but he almost had more a comedic edge to his character. This is why some more well known comedic actors like Ice Cube, David Allen Grier, and Dave Chappelle were all offered the part. 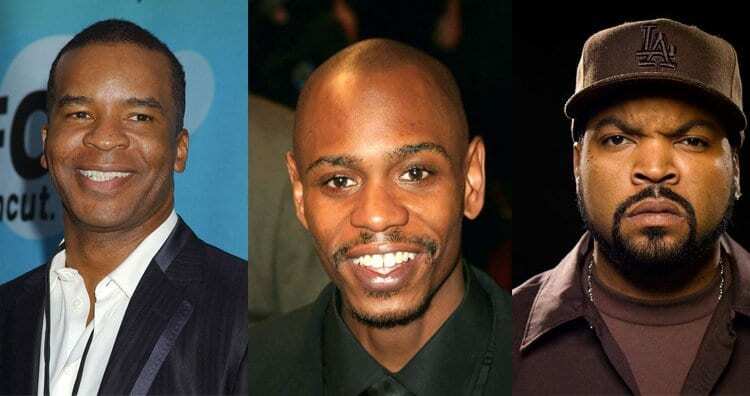 Ice Cube declined because he didn’t feel comfortable playing a character with a disability and Chapelle passed up on the part because he thought the film would be a flop. Boy, was he wrong. It’s hard to picture anyone but Robin Wright playing the role of Jenny Curran because she seemed to completely embody the character. While we’re glad Wright was the one who got the role, there a few other top contenders for the role. Jodie Foster, Nicole Kidman, and Demi Moore were all approached to play Tom Hanks’ love interest but each actress rejected the part off-hand. If only they knew how successful the movie became maybe they would have changed their minds. Doesn’t the Gump house look familiar? Forrest’s home in the movie has such a distinctive look to it, but you might not have realized that it was used again. 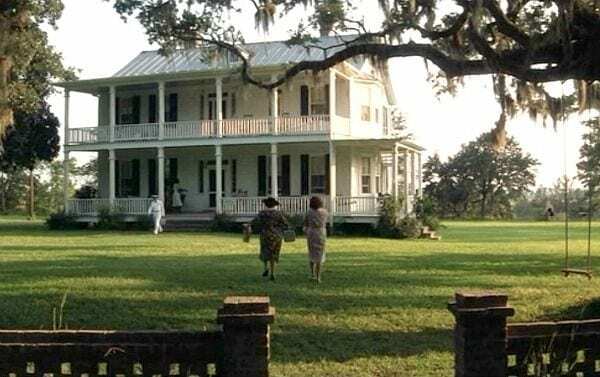 Six years after Forrest Gump, the famous Southern style home was used in another big classic hit – The Patriot. The Mel Gibson flick shot scenes both inside and outside of the house, as well, but the interior was re-paneled before getting the scenes on camera. This might explain why it doesn’t look too familiar in The Patriot and could pass as a different house. 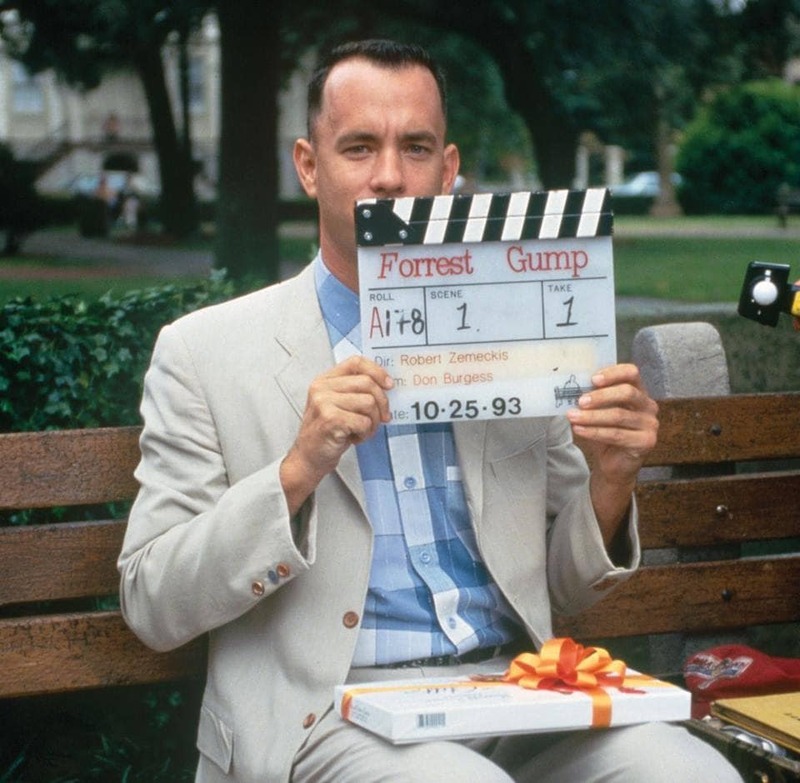 Tom Hanks signed on to play the title role of Forrest Gump just one and a half hours after receiving the script. There was something about it that he just immediately connected with and knew that he wanted to be a part of. He did, however, sign on the dotted line with his own conditions. Hanks agreed to be the movie’s star if, and only if, it was historically accurate and didn’t cut any corners. Good on you, Tom. While on set Robin Wright set to place aside her physical health for the movie’s most pivotal scenes, but she wasn’t the only one. 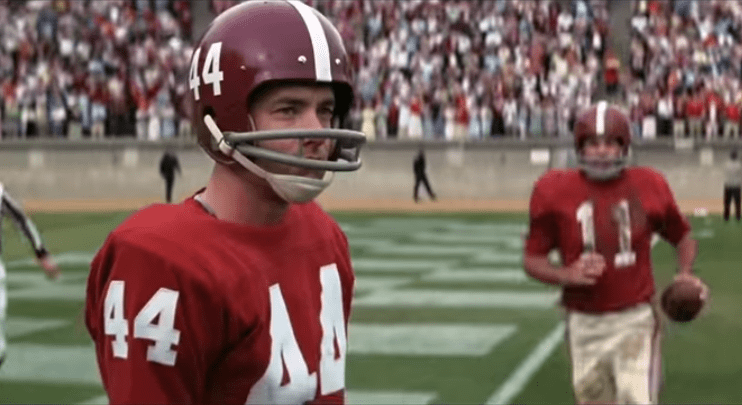 When he was shooting the football scenes, Tom Hanks was reportedly suffering from Influenza, which is not so easy to work through, but that didn’t stop him. Forest should have been running himself to a hospital, not across a college football field, but we can all definitely appreciate the effort he put in to it. The scene where a young Forrest Gump is sitting on a school bench outside of the principal’s office didn’t just come out of nowhere. 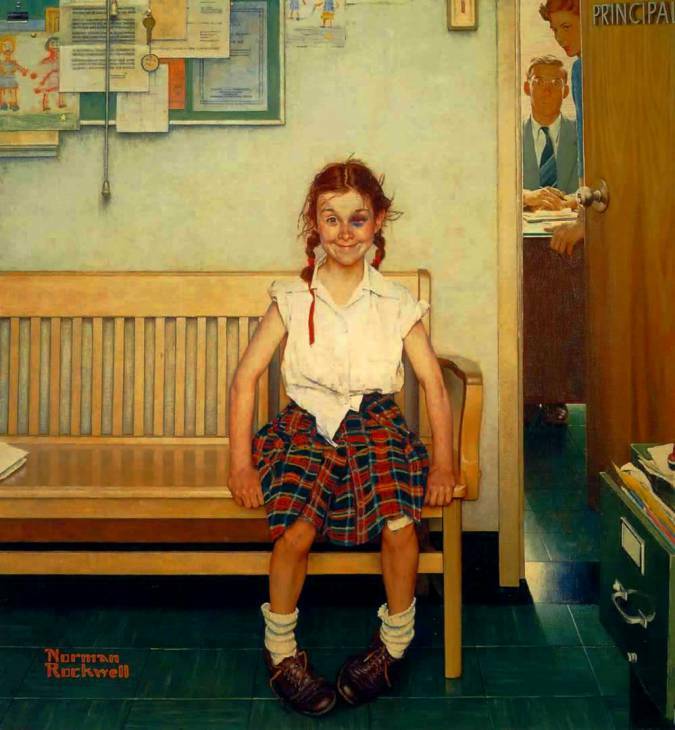 The filmmakers were inspired by Norman Rockwell’s painting ‘Girl with the Black Eye’ and they wanted to pay a bit of homage to it in their movie. 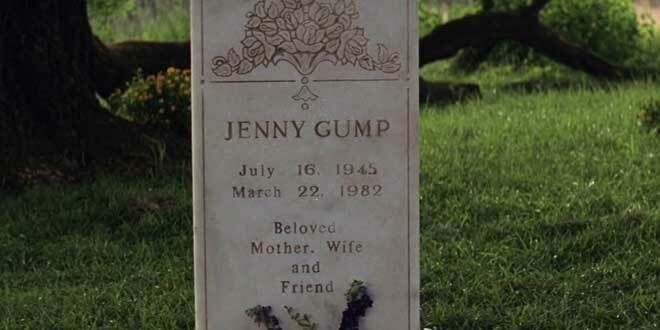 While the circumstances surrounding the principal’s meeting with Mrs. Gump may be slightly different but the point was still pretty much made, and we can certainly see the resemblance. Given the era that the movie was taking place in, the filmmakers had plenty of well known music from that time period to choose from. However, there is one band that appears more than others. 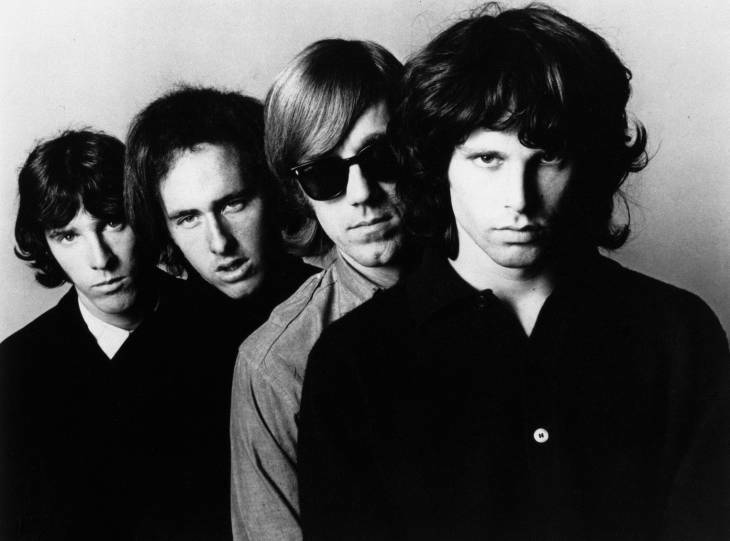 The Doors had at least 6 songs on the movie’s soundtrack, more than any other band who was featured in the film. At the time, The Doors were still a favorite amongst movie goers and more particularly, the patrons who went to see Forrest Gump in theaters. No one likes a bully, but the kids cast to play these bullies were pretty special. The children who made fun of Forrest (and annoyed Jenny) on the bus rides to school were none other than Tom Hanks’ daughter, Elizabeth, and the director’s son, Alexander. And we have to say, they did a great job at convincing us they were really bullies. Similar to finding extras for the peace rally scene in Washington DC, producers found the perfect fits where they could. Tom Hanks might be an incredible actor, but even he couldn’t muster up physical prowess where it didn’t exist. 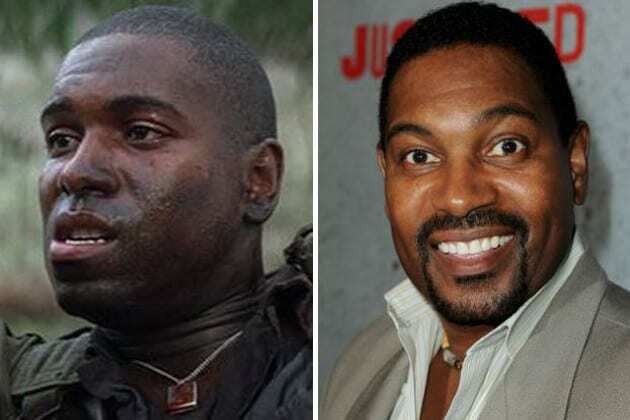 In fact, Hanks couldn’t actually hold the weight of Mykelti Williamson during the famous jungle scene where he carries him off the battlefield. 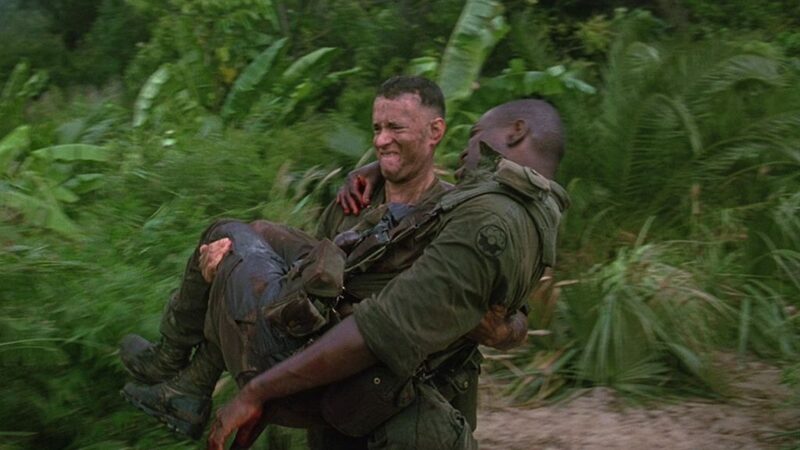 To help make it look like he could, behind the scenes, crew members had attached an invisible, suspension line to Williamson so it would appear as if Hanks was actually carrying him. In the book version, Forrest actually becomes an astronaut. 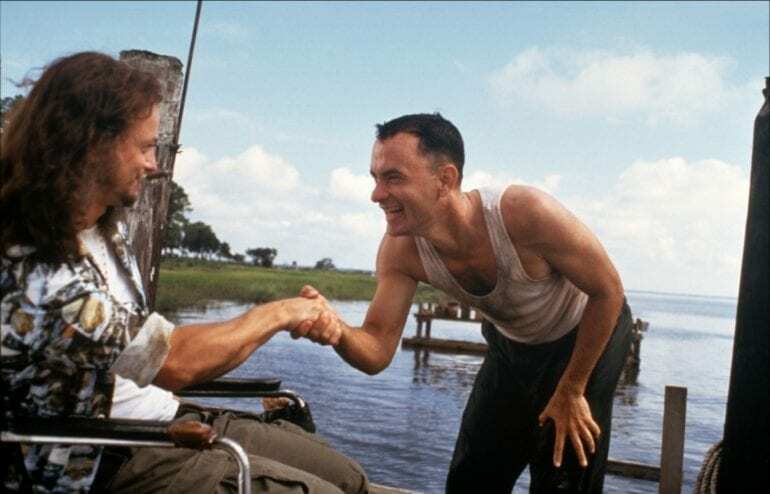 Lieutenant Dan’s line in the film “If you’re ever a shrimp boat captain, that’s the day I’m an astronaut!” is meant to be an inside joke, since Forrest doesn’t fulfill the dream on-screen. Ironically enough, though, Gary Sinise and Tom Hanks went on to co-star in Apollo 13 one year later, in 1995. Tom Hanks, leading actor who played Forrest Gump, said that he totally ad libbed the line where he says: “My name is Forrest Gump. People call me ‘Forrest Gump”. For those of you who have seen this cult film, this line describes Gump the best as he says it with such a straight face you can’t help but laugh. 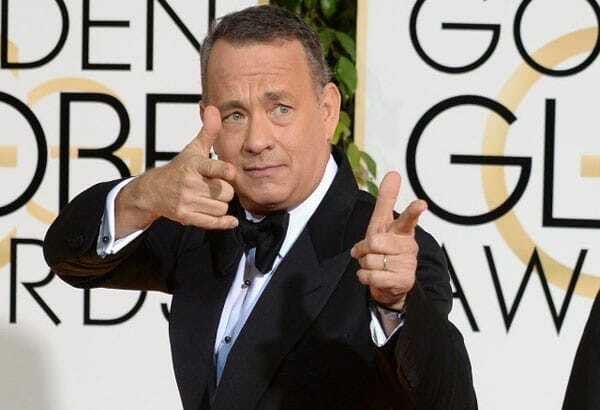 Tom Hanks, who has not a lick of a southern accent to his name, learned his heavy accent from the actor who played the younger Forrest Gump in the film, actor Michael Humphreys. Michael was a native of Mississippi and therefore had a pretty thick accent himself, which he did not have to fake in the film. It’s safe to say that Tom Hanks has had a career that would make any other actor in Hollywood envious. Hanks has gotten to pick his roles since Gump and has won him multiple awards as a result. Hanks’ career was already on the rise when he took the role of Forrest but skyrocketed as a result of the film. Robin played the role of Jenny Curran, Forrest’s good friend and love interest. While their love story made us all swoon, it was Robin’s career that took off like firecrackers thereafter. Wright was known for her role as Buttercup in the film The Princess Bride from 1987, that was without a doubt her breakout role. However, her role as Jenny made her a household name and catapulted her to her role in Message in a Bottle. 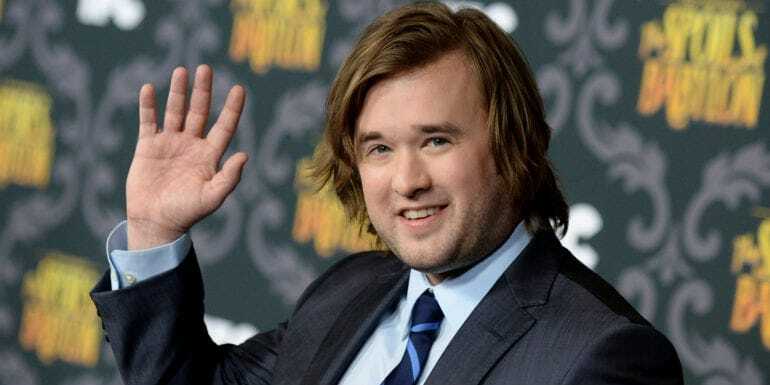 As we mentioned earlier, Haley Joel Osment, the young adorable blonde boy who plays the son of Forrest Gump with Jenny Curran, was introduced to film through Forrest Gump. It was after his time on the screen in Forrest Gump that he landed his breakout role in The Sixth Sense, followed by a long list of other roles while he was a young one. Today, Osment is lesser known and heard of but we are sure he is bound to make a comeback. 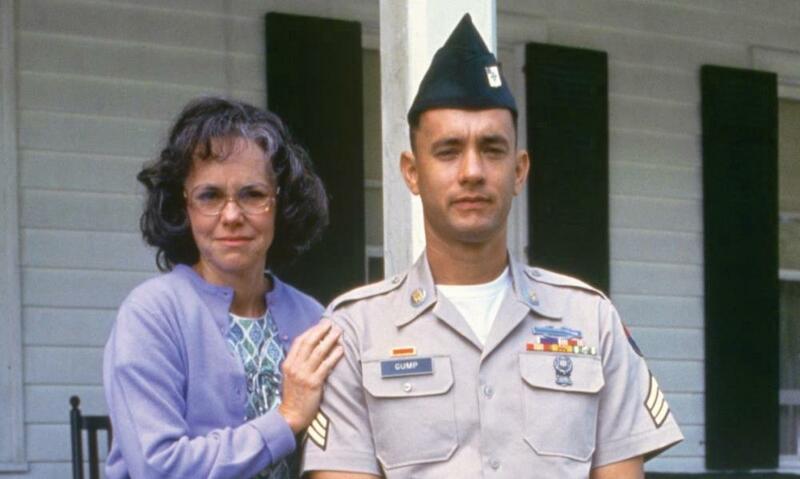 While we mentioned that Sally Field, the actress who played Mrs. Gump, was only 10 years older than Tom Hanks was when he played the adult Forrest, Field was a name that the film needed in order to attract some much wanted attention from the public for the film. She had already had an incredible career before this movie, so she was the one who really had the star power to bring people in. Field’s role as the matriarch of the Gump family made her career brighter as well. When Jenny and Forrest get together towards the end of the film we were all overjoyed. When we learned that Jenny was sick and dying we were all heartbroken. However, we learned after the fact that Jenny died from Hepatitis C. In the film, Jenny says to Forrest, “I have some virus, and the doctors, they don’t know what it is, and there isn’t anything they can do about it.” There was some debate whether the virus in question was HIV or not, but it was concluded that Hepatitis C was the true answer as revealed in the sequel book, Gump & Co. While filming, actress Robin Wright has to endure a 24-hour shoot the day that her character was set to perform naked on stage with a guitar. Unfortunately, poor Wright had a cold the day they were filming, which was only made worse by her lack of clothes. In addition to sitting there naked, Wright was in fact actually singing in the scene and not lip syncing. We are very impressed with her determination and skill.